Looking for fast, affordable lawn care services in Augusta, Georgia? Look no further! Lawn Love makes getting lawn care services as easy as a press of a button. Get an instant quote for lawn care services near you such as lawn aeration, lawn mowing, leaf removal, gutter cleaning, gardening, yard care, weed control and more. Lawn Love has finally brought the lawn care service industry into the modern century. It's never been easier to get lawn care services to you. See why we're rated #1 in lawn care services company in Augusta, Georgia. Augusta is known the world over for the Masters Golf tournament, but to you, it's simply the place you call home. You may not aim to have your lawn as pristine and perfect as the Augusta National Golf Course, but you still want to come home to a lawn that's beautiful and welcoming. But who has the time for that? The answer is simple: the people who call Lawn Love. Lawn Love is a fully insured and bonded lawn care service. Our teams of experienced and friendly lawn care technicians want to help make your lawn picture perfect. They can take care of all the weeding, seeding, trimming, mowing, fertilizing, and aeration – all you have to do is contact them to get started! To finally have the lawn of your dreams, give Lawn Love a call today at 706-250-4429. Make sure to ask about our free, fast and easy two-minute quote so you can see just how far a little Lawn Love can take you! 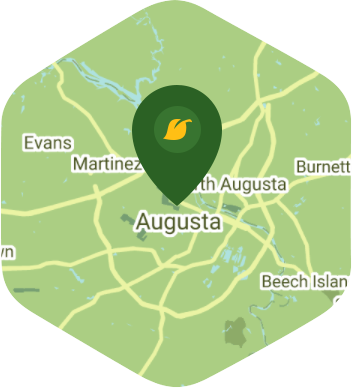 It looks like the expected precipitation in Augusta is 0.03 inches, which means you will probably have to water your lawn today. Dusk and dawn are the best times to water your lawn (the sun will rise at 6:46 AM and set at 8:06 PM today in Augusta). Average lawn size 7,672 sq. ft.